Our stroller is rated to carry up to 100 pounds, but we've easily pushed weights far greater than that in it. 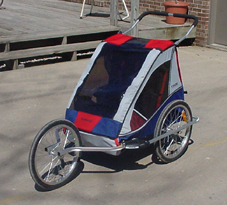 In fact, we took turns sitting in the stroller and having the other push, and while difficult it was not impossible, and the stroller held up perfectly well. That being said, we are hoping to carry roughly 70-90 pounds (not including the stroller itself.) While this may seem like quite a bit of weight, until you realize what we need to carry. Water - This is huge. It's probably the single most important and heaviest thing that we will carry, and we'll likely have 1-2 gallons of water at all times. We will be sweating far more than a normal person would, and therefore we will require much more water to replenish what we've lost. And don't forget: Water is about 8 pounds per gallon. Food - Obviously we need to eat! We already probably eat about 3000 calories each on average per day. That number will probably be closer to 6000 calories each during the run. That means lots of "energy packed" foods, such as bread, pasta, oatmeal, and others. We also need other food items, such as powdered drink mix (I.E. Endurox, Accelerade, Gatorade Mix.) We don't want our costs to skyrocket for this trip, which means we'll try to cook as much food as possible in our own cooking ware. Clothes - We need to wear something! While we will probably have 3-4 changes of clothes each, this still adds up to extra weight, and more importantly, space taken in our stroller. We are considering having our clothes bags double as our pillows. Sleeping bags - Need to have something to sleep on when we camp out. These will need to be rated to a fairly low temperature, even though we are doing our run during the hottest time of the year. We will likely also carry sleeping pads. Tent - We haven't decided on a model yet, but it needs to be large enough to hold the two of us, and the stroller, which can only be folded up to an extent. While this isn't extremely heavy, it still takes up space. Toiletries - These things add up! Toothbrushes, soap, shampoo, deodorant, contacts and contact solution for Matt, toilet paper and much more. Shoes - We plan on having these mailed or given to us at certain points along the trip, but we'll still likely have two pairs each, which means two pairs in the stroller at all times. 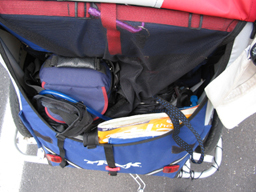 Extras - Here is everything else we plan on bringing, such as a digital camera, an Ogo, first aid kit, a couple Bibles along with 1-2 other books, flashlights, tire pump, extra tire, ID's, traveler's checks, notebooks, pencils/pens, etc. When you look at this list, you begin to really appreciate how much we have into 70-90 pounds, and how heavy that can be, especially over 3000 miles. We're doing our best to trim back what we have to bring, but there is only so much you can really trim, and we're still discovering new things that we need!